English European Golden Retrievers home of the most beautiful dogs in the world. Special thanks to Chris and Pam, Miranda, for doing such a great job with the dogs! We are proud to announce that two more movies have been produced starring our dog from Pebbles and Storm. We are pleased to announce that "Starr Golden’s Puppies" are "Movie Stars" all footage of our puppies was shot on our premises. They will be making their debut appearance at 8 weeks of age. "Duke Franke" from the same litter is the featured "Star" playing the leading role of Bailey in the movie "Adventures of Bailey: The Lost Puppy" produced by Engine 15 Media Group LLC and Hungry Bear Productions. Get ready for non-stop fun and adventure as Bailey meets new friends and learns a lesson or two about family, friendship and the importance of "staying in the car"! We have worked very hard to have the best imported dogs in the USA, European Multi Champion bred goldens. All of our imported dogs have at least one or both parents that are titled in show and/or field. 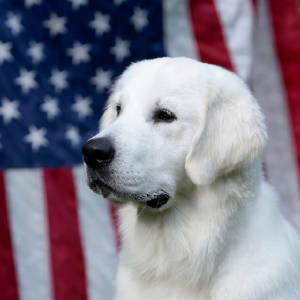 All of our dogs are imported from the top English golden retriever breeders in the world. Most of our dogs were bred by show judges in Europe. Our goal is to better the breed and produce beautiful, healthy, intelligent English Golden Retrievers with a sound temperament, bred according to the original standard. 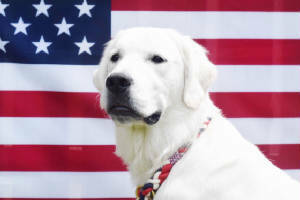 We are dedicated to the improvement and advancement of the English Golden Retrievers in America. This is the most beautiful of breeds and nothing compares to the lovely dark eyes of a true English Golden. Please also consider rescuing a Golden Retriever as many are in need of good homes. European Golden Retrievers, English Cream Golden Retrievers, White Golden Retrievers, English Golden Retriever, English Cream Puppies, European Cream Puppies, English Cream Retriever, English Cream Retrievers, English Cream Goldens, White Golden Retrievers, WhiteGolden Retriever, British White Golden Retriever Puppies, English Cream Retriever Puppy, English Cream Golden Retriever, European White Golden Retrievers, British Golden Retrievers, British Cream Golden Retrievers. But what they truely are...is a Beautiful Golden Retriever. With the loss of my wife and co-owner of Starr Goldens we have had to make alot of adjustments. We would like to thank everyone for all the prayers and support. Starr goldens has a good friend helping us that has fit well within expectations. Our goal remains the same... which is to produce first healthy, stunning, show quality, well cared for English Golden retrievers.